Dexion Evicus, an Imperial spellsword, is a Moth Priest. He came to Skyrim following rumors of an Elder Scroll being found. He is captured by Malkus while being escorted by Imperial guards and held in a magical cage inside Forebears' Holdout. If you sided with the Dawnguard, he will travel back to Fort Dawnguard after being rescued and remain there. If you are working with the vampires, you will make him your thrall and he will then stay at Volkihar Keep. Dexion wears Moth Priest robes and a pair of Moth Priest sandals. He is equipped with a unique sword named the Akaviri Sword, and carries three potions of plentiful healing. He knows the Alteration spell Stoneflesh, the Destruction spells Fireball and Flames, and the Restoration spell Fast Healing. Regardless of which side you join, Dexion will eventually become blind from reading the Elder Scrolls and wear a blindfold for the rest of the game. Seeking Disclosure: Bring the Elder Scrolls to Dexion. His unique Akaviri Sword is only obtainable by using the Pickpocket perk Misdirection or the Disarm shout. Dexion will purchase the two Volkihar Elder Scrolls from you for the sum of 6,000 gold following the completion of Kindred Judgement if allied with the Dawnguard. 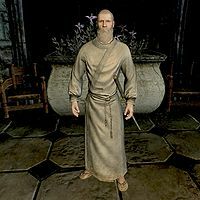 If you have sided with the vampires, you will be unable to sell the Elder Scrolls to Dexion as he lacks the dialogue to do so. This issue has been addressed by version 1.2.2 of the Unofficial Dawnguard Patch; it adds the appropriate dialogue for buying the scrolls when you side with the vampires. Dexion can occasionally be seen acting as though reading an Elder Scroll in the center room of Fort Dawnguard after the quest Seeking Disclosure. Dexion may remain in the recovery position and still count as an enemy. You may or may not be able to converse with him, but if you are and you tell him to go to Fort Dawnguard, he will then be attacked by Isran and it will be impossible to continue the quest. The console command tcl can be used to reach Dexion without disengaging the barrier. Dexion will be friendly, will initiate dialogue, and will successfully reach Fort Dawnguard afterward. The quest marker to disengage the barrier will remain until the quest's completion, but the quest will otherwise proceed normally. Open the console and select Dexion, either by clicking on him or entering prid xx007b88 (the first two digits vary depending on loaded mods), then use the command setav aggression 0. This makes Dexion passive again and the quest can proceed normally. With the Dragonborn add-on, it is possible to use a two or three syllable Bend Will shout on him to prevent him from being hostile. If Dexion is injured on the floor, simply use a healing spell on him to continue with dialogue. Repeat these steps if he remains busy, as he will eventually continue the quest. If you are an Imperial or have a high enough Illusion skill, you can use Voice of the Emperor or a spell to calm him and continue with the dialogue. You will have to do this every time you walk into Fort Dawnguard though, so if you are using Voice of the Emperor, wait a day for the power to reset. Esta página foi modificada pela última vez à(s) 21h27min de 9 de março de 2014.